At the shore of Lake Bostal, a recreational area in the Saarland, construction is now completed and the 4-star hotel will be opened on July 1rst. It will house 100 rooms, suites, a spa area of 2,000 m² (21,560 ft²), restaurants and offers meeting facilities. The experience of environmental quality and comfort – center piece of all our concepts – are the base for satisfied guests, and thus the foundation for a successful hotel operation. At the same time low energy and maintenance costs lead to an economic operation. 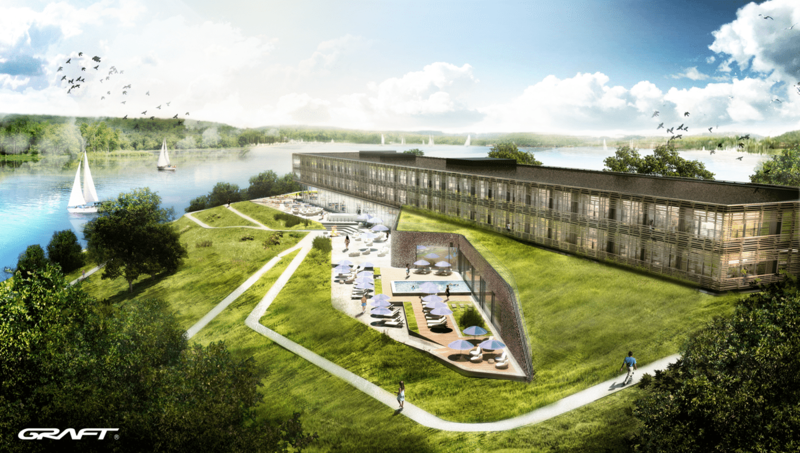 One target of the project Hotel at Lake Bostal is to demonstrate that a high level of comfort can be achieved without increasing the energy demand. Transsolar advised the architect GRAFT and client HotelKur throughout the integrated planning process and used thermal, daylight and CFD simulations to iteratively develop the energy and comfort concept.